A flotilla of traditional Thames rowing skiffs, manned by Swan Uppers in scarlet rowing shirts and headed by The Queen’s Swan Marker, wearing a hat with a white swan’s feather, row their way steadily up the Thames. ‘All up!’ they cry as a family of swans and cygnets is spotted, and the Swan Uppers carefully position their boats around the swans, lift them from the water and check their health. The Swan Marker’s iconic five-day journey upriver has been an annual ceremony for hundreds of years, and today it has two clear goals; conservation and education. Swans are, of course, no longer eaten, but Swan Upping still takes place once a year on the River Thames. The Swan Uppers weigh and measure the cygnets and check them for any signs of injury, commonly caused by fishing hooks and line. The young cygnets are ringed with individual identification numbers that denote their ownership if they belong to the Vintners or the Dyers livery companies; they cygnets’ ownership is determined by their parentage. However, all Crown birds are left unmarked. The Queen retains the right to claim ownership of any unmarked mute swan swimming in open waters, but this right is mainly exercised on certain stretches of the River Thames. The Crown has held the right to claim ownership of all unmarked mute swans swimming in open waters throughout the country from as far back as the twelfth century. Historically, valuable rights of ownership were subsequently granted by the monarch to many people and organisations as swans were a prized food, served at banquets and feasts. Today, of course, swans are no longer eaten and are a protected species. Apart from the Crown, there are only three organisations that have retained their right of ownership of mute swans and maintained their unique swan marks. Originally, marks were made on the top of the swan’s beak, and were recorded within a swan roll made of velum. Current day ownership marks are made by way of a small numbered leg ring but all Crown birds are left unmarked. Abbotsbury Swannery was granted the right of ownership in the fourteenth century and two London livery companies, the Vintners and the Dyers, have held similar rights since the fifteenth century. Many hundreds of years ago there were severe penalties for injuring or killing a swan. A criminal could face imprisonment for one year and a day for even stealing swan eggs. Today, the Crown’s right of ownership exists by Royal prerogative. The law relating to ownership of mute swans applies to dead as well as live birds and to any parts thereof. Permission may be granted via The Queen’s Swan Marker for a dead mute swan or mute swan parts to be used for educational purposes; however, under the terms of such a permission, it/they may not be sold for profit but an educational establishment or museum may be permitted to pay a taxidermist for their work. Furthermore, any appropriate documentation should be retained as evidence of the existence and terms of any permission. More information can be obtained from The Office of The Queen’s Swan Marker, at [email protected]. Conservation is very important to the swan population on the River Thames and their protection is vitally important to their continued survival. The increasing use of rivers for boating, fishing and other recreational activities severely inhibits the swans’ natural habitat. Steel and concrete, used to prevent the erosion of river banks, results in the disappearance of river weed and reed beds that historically have provided the natural habitat on which swans feed and nest. Predation by creatures such as mink, which can destroy a family of young cygnets, has increased significantly in recent years, along with birds of prey, foxes and domestic dogs. Man has also had a devastating impact upon the mute swan population; swans are commonly being shot and killed and their nests and eggs destroyed. Continuing efforts are being made to educate people about the environment in which they live and the sanctity of the wildlife that surrounds them. Whenever possible, injured swans are rescued, rehabilitated and released back to the wild. 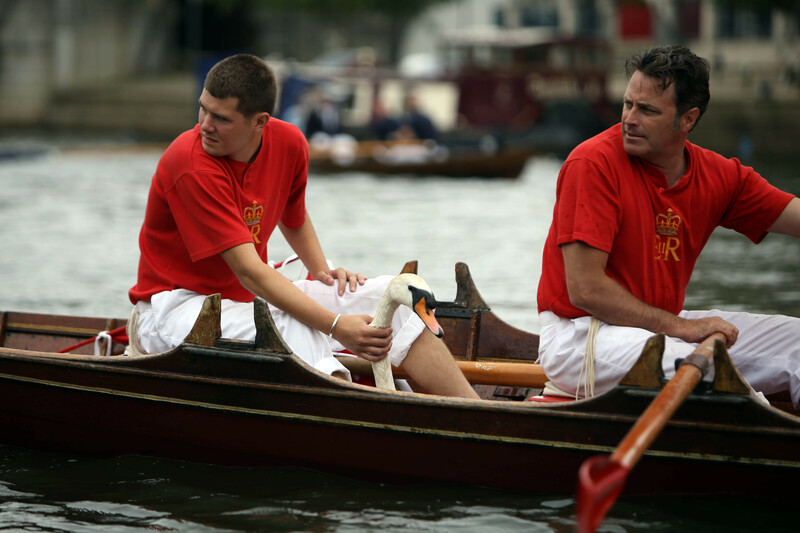 Today marks the start of the five-day #SwanUpping ceremony, led by The Queen's Swan Marker. 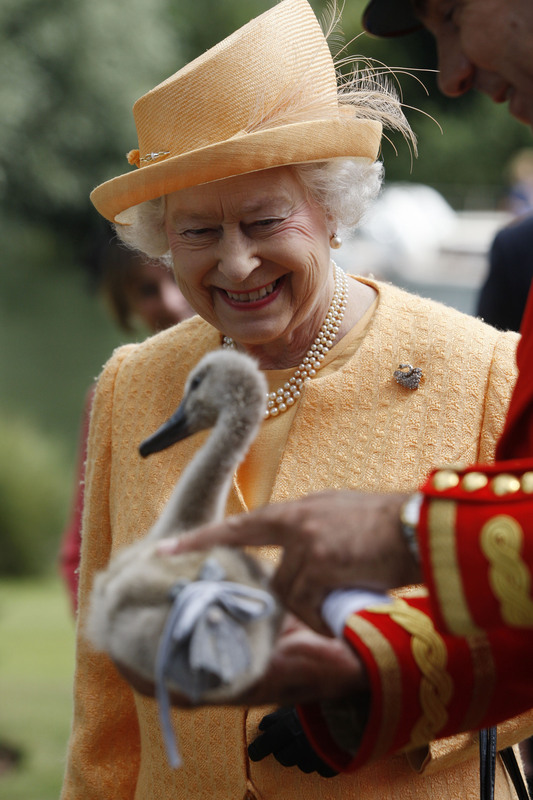 The historic ceremony dates back to the 12th Century, when the Crown claimed ownership of all mute swans. 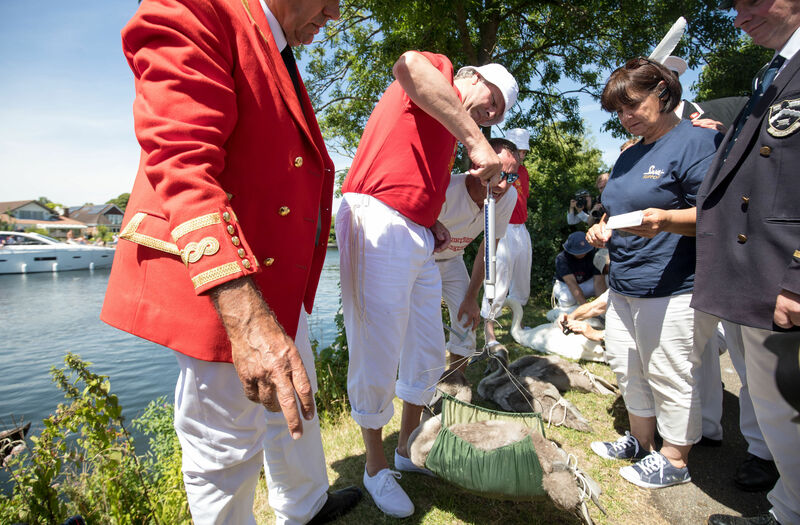 In the Swan Upping ceremony, The Swan Markers identify, weigh, and health check cygnets before releasing them. The Swan Upper advises organisations throughout the UK on swan welfare, and works with fishing and boating organisations, helping them work with existing wildlife and maintaining the swans' natural habitat. Children from local schools are invited every year to watch the ceremony so they too can learn how to protect the local swan population. Swans are also at risk of injuries caused by discarded fishing tackle that can result in a slow and painful death. Although the majority of fishermen are careful, those who do not respect the river and its wildlife cause immense problems and suffering. The Queen’s Swan Marker advises on the co-ordination of the removal of swans from rivers while rowing regattas take place, to avoid injuries being sustained by swans and young cygnets during the racing. He also works closely with swan rescue organisations based on the River Thames and co-ordinates the movement of swans when necessary for their protection or safety. 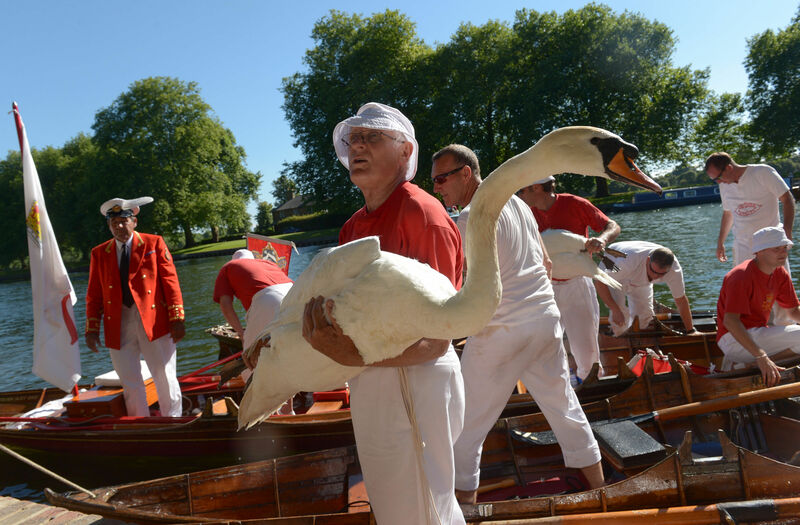 Education plays a significant part of Swan Upping in July each year. Many children from local primary schools visit the Swan Markers and Swan Uppers at several locations along the banks of the River Thames as they travel on their journey upstream to Abingdon. The children have the opportunity to learn about the biology of swans, the habitat they need to survive, the river and the boats and equipment used by the Swan Uppers. 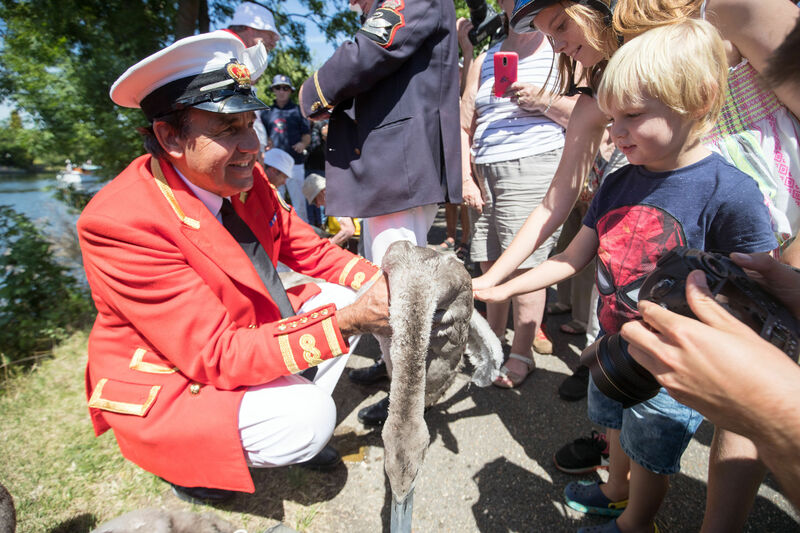 The Royal connection with swans is always of great interest to the children who take part in a question and answer session hosted by the Swan Markers, during which they demonstrate the knowledge they have gained from studying Swan Upping in school before their visit. The children also have the opportunity to view cygnets at very close quarters which is always a highlight of their day. The Queen’s Swan Marker works closely with the River & Rowing Museum educational department based at Henley on Thames. The joint development of a Swan Upping box for the Reading Museum Loan Box Scheme facilitates learning in a wide range of disciplines around the subject of Swan Upping in the classroom. For enquiries regarding educational talks given by The Queen’s Swan Marker please visit www.royalswan.co.uk or email [email protected]. This year, Swan Upping will begin on Monday 16 July, departing from Sunbury Lock Cut, and will finish at Abingdon Bridge in Oxfordshire on Friday 20 July. "Last year saw a significant improvement in cygnet numbers compared to the last two years, with a total of 132 new cygnets on the River Thames. This uplift was welcomed after an outbreak of Avian Influenza at the start of the year. "Floods and fast flowing water in April posed a further challenge - however some breeding pairs have now successfully rebuilt their nests. "Throughout the year we have been delighted that members of the public have kept a watchful eye on so many of the nesting swans. It is encouraging to see how important the welfare of swans and their young cygnets are to so many people." Swan Upping aims to educate people about swan welfare and the need to protect our mute swan population. 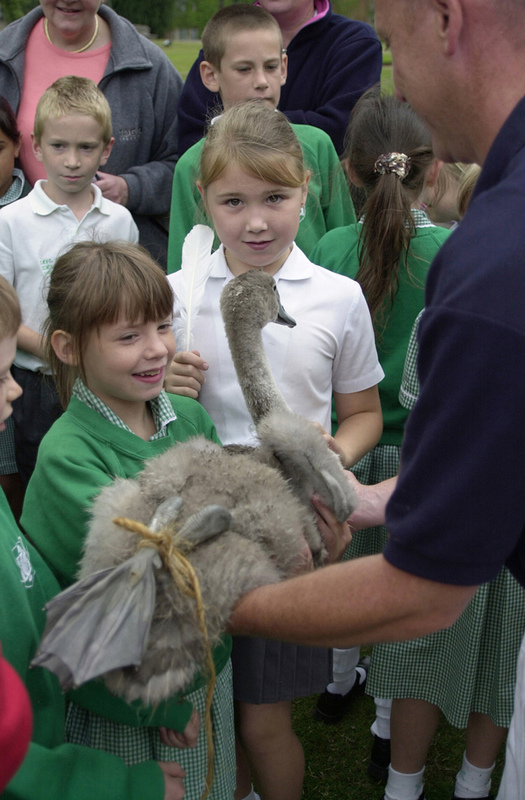 Several primary schools will therefore join for the journey up river, and have the opportunity to learn about the mute swan's biology, the boats used and the Royal connection. Local schools seeking further information about Swan Upping week should contact the Swan Marker’s office on 01628 523030 or email [email protected]. The Queen hosts a ceremony at Windsor Castle to celebrate the 40th Anniversary of Motability. Nous avons le devoir de nous souvenir et d’honorer Ia mémoire de ceux qui ont servi vaillamment et qui ont tant donné ici, sur la crete de Vimy, et tout au long de la Premiere Guerre mondiale. It is our duty to remember and honour those who served so valiantly and who gave so much here at Vimy Ridge and throughout the First World War. Prince Philip and I were deeply saddened to learn of the devastating flooding and landslides in Mocoa this weekend. It is estimated that 60 million people still live in fear from the threat of landmines. In 2015, global deaths and injuries from landmines reached a ten-year high; but perhaps more shocking is the fact that almost 80% of them were civilians. My thoughts, prayers, and deepest sympathy are with all those who have been affected by yesterday's awful violence. I am delighted to join you on behalf of Her Majesty The Queen, to bring to a close our year of joint celebrations, marking 200 years of friendship and cooperation between Nepal and the United Kingdom.